Sarah F. (Lawson) Johnson was the oldest daughter of Albert Gallatin Lawson and was born 25 December 1859 in the Pleasant Grove Area of Walker County, AL. 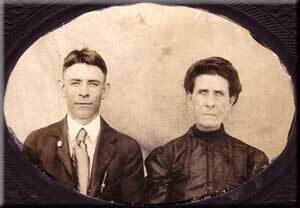 She died 5 January 1926 in Talihina LeFlore County, Oklahoma. She married Columbus Washington Johnson in Alabama and then moved to the Indian Territory. 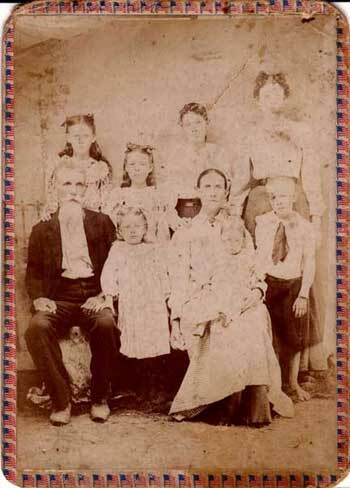 In the picture, which was taken before 1896, in the back row, from left to right is Sarah Mellinda, Leona, Fleeter and Mary E. Harrietta and in the front, left to right is Columbus Washington, Nancy Idella, Sarah F. holding Mattie Lee and George Washington Johnson. Two of their younger children were not born when this picture was taken. Sarah F. and her youngest son, William Lee Johnson.